When passing through Charles De Gaulle airport in Paris, you notice the billboards: Their messages change. I don’t mean that they have the simple capacity to switch between three different displays as most outdoor billboards around the world are able to do. These billboards exhibit unlimited change. They display whatever message is required at any particular second. How is this possible? 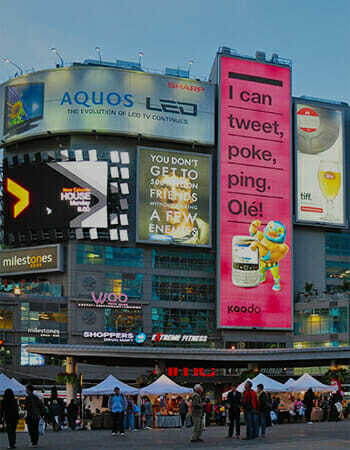 The billboards are actually digital TV screens that link directly to the outdoor-display company’s database. Let’s cross the Channel to London. In the streets of that city, people are busier typing text messages into their mobile phones than they are using the phones for conversation. Here you notice the instant attention given by text recipients to their received messages. They love receiving text messages, and they devote their full attention to them as soon as the “beep-beep” alerts them of a message’s arrival. Soon, when our Internet connections are no longer dependent on dial-up modems but are always on, 24 hours a day, 7 days a week, we’ll notice that our Web use will change dramatically. Instant commercial messages and emails will acquire new significance: They might offer 50 percent discounts for customers who respond within five minutes of receiving a promotional message, for example. Consider this. Ten years ago you had to plan a TV campaign at least a year ahead. You had to book it at least three months ahead, and you had to start production at least four months prior to airing. That lead time has evaporated. The months of preparation have been reduced to hours. Now let’s imagine some scenarios. Imagine that Shell Oil faces an environmental controversy of some sort. Instant branding would allow the company’s marketers to communicate a clever message via all instant media channels within hours, circumventing the growth of any negative publicity in the marketplace and restoring the desired equilibrium to public perception. Imagine that your competitor decides to drop its product prices by 5 percent. Instant branding would mean that you could respond appropriately with all due expedience, using instant media channels. Imagine that the temperature hits 90 degrees Fahrenheit. Coke’s marketing machine might be triggered into action, sending instant commercial messages that promote a “heat wave” sales drive. Or imagine that some newspaper scooped a fabulous photo of Tom Cruise: Its promotion via instant media would double the tabloid’s sales in hours. Instant branding is, without any doubt, a tool every marketing director has been waiting for. But it’s a challenging tool; it deteriorates marketing plans that depend on one- and two-year time frames. Instant branding both puts into question and calls on the advertising business’s ability to manage brands cleverly, spontaneously, and within a flexible strategy. There may only be hours to control a brand’s destiny. My question is, How do you reckon you’re going to plan your marketing campaign knowing that you’re likely to have to change your message dozens of times a year, knowing that that change will be initiated by a thousand variables: what your competitor might do, what the result of a local soccer game was, what the weather is like at any moment, what the traffic conditions are on the nearest highway? I promise you this: This is just the beginning. And this beginning signifies the end of any marketing plans that we’ve used over the past decades. Instant branding will stamp question marks on lots of things we’re used to doing in advertising. Because we suddenly have a license to react — fast!